Huddersfield Town recovered from conceding a goal inside the first minute to draw with Brighton. Beram Kayal made it 1-0 to the Seagulls after 17 seconds before Town had even touched the ball. Jacob Butterfield equalised for the hosts after the break with a powerful strike from a tight angle. Huddersfield, without a win this season, pressed for a winner but visiting keeper David Stockdale saved well from Terriers striker Nahki Wells. Town, who had taken just one point from their opening two games, made the worst start imaginable when Israeli Kayal curled home after good work by Sam Baldock from the kick-off. Chris Powell's side could have fallen further behind when another Kayal shot was deflected out for a corner. Town improved as the half wore on with Butterfield, the target of two bids from Derby County, going close with a free-kick before Ishmael Miller forced a fine save from Stockdale after the interval. Butterfield equalised for the hosts with a ferocious effort after Brighton failed to clear a corner. Wells twice went close to winning it for Huddersfield, while substitute Chris O'Grady headed just over for the Seagulls in an exciting end to the game. "The goal rocked us in the first period and everyone was stunned. We couldn't get ourselves going and we needed half-time. "We are a work in progress. We have a few new players and we showed here what we showed last season, that we have to play to our maximum. "Other teams have spent some money and we know we are in no position to do that." "If you had said that to me at the start of the season, with two of the three games away from home, I would have been delighted. "We couldn't have made a better start to the game and it was one of those strikes that as soon as he hit it you knew it was going in. "There were too many occasions when the first pass went astray. Overall a draw was a fair result but the best two chances of the game fell to us." Match ends, Huddersfield Town 1, Brighton and Hove Albion 1. Second Half ends, Huddersfield Town 1, Brighton and Hove Albion 1. Attempt saved. Kazenga Lua Lua (Brighton and Hove Albion) left footed shot from outside the box is saved in the bottom right corner. Assisted by Dale Stephens. Attempt missed. Nahki Wells (Huddersfield Town) right footed shot from the left side of the box misses to the right. Assisted by Jason Davidson. Attempt missed. Chris O'Grady (Brighton and Hove Albion) header from the centre of the box is just a bit too high. Assisted by Jamie Murphy with a cross. Chris O'Grady (Brighton and Hove Albion) wins a free kick in the attacking half. Corner, Brighton and Hove Albion. Conceded by Jonathan Hogg. 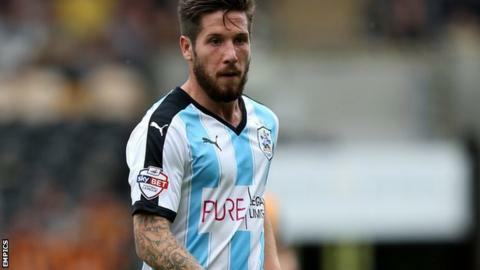 Jacob Butterfield (Huddersfield Town) is shown the yellow card. Kazenga Lua Lua (Brighton and Hove Albion) wins a free kick on the left wing. Substitution, Brighton and Hove Albion. Jamie Murphy replaces Solly March. Attempt blocked. Dale Stephens (Brighton and Hove Albion) right footed shot from the centre of the box is blocked. Substitution, Huddersfield Town. James Vaughan replaces Ishmael Miller. Substitution, Brighton and Hove Albion. Chris O'Grady replaces Sam Baldock. Offside, Huddersfield Town. Jonathan Hogg tries a through ball, but Jason Davidson is caught offside. Corner, Huddersfield Town. Conceded by David Stockdale. Attempt saved. Nahki Wells (Huddersfield Town) right footed shot from the right side of the box is saved in the bottom right corner. Corner, Huddersfield Town. Conceded by Bruno. Attempt missed. Dean Whitehead (Huddersfield Town) right footed shot from outside the box is high and wide to the right. Assisted by Harry Bunn. Offside, Brighton and Hove Albion. Solly March tries a through ball, but Beram Kayal is caught offside. Attempt blocked. Sam Baldock (Brighton and Hove Albion) right footed shot from the centre of the box is blocked. Assisted by Dale Stephens. Substitution, Brighton and Hove Albion. Rohan Ince replaces Tommer Hemed. Attempt missed. Kazenga Lua Lua (Brighton and Hove Albion) right footed shot from long range on the left is close, but misses to the left. Assisted by Solly March. Jason Davidson (Huddersfield Town) wins a free kick in the defensive half. Attempt blocked. Solly March (Brighton and Hove Albion) left footed shot from outside the box is blocked. Assisted by Sam Baldock. Foul by Tommer Hemed (Brighton and Hove Albion). Beram Kayal (Brighton and Hove Albion) wins a free kick in the attacking half. Goal! Huddersfield Town 1, Brighton and Hove Albion 1. Jacob Butterfield (Huddersfield Town) left footed shot from a difficult angle on the left to the high centre of the goal following a corner. Corner, Huddersfield Town. Conceded by Solly March. Attempt saved. Ishmael Miller (Huddersfield Town) left footed shot from the right side of the box is saved in the centre of the goal. Assisted by Jonathan Hogg. Attempt missed. Harry Bunn (Huddersfield Town) left footed shot from outside the box is too high following a corner.